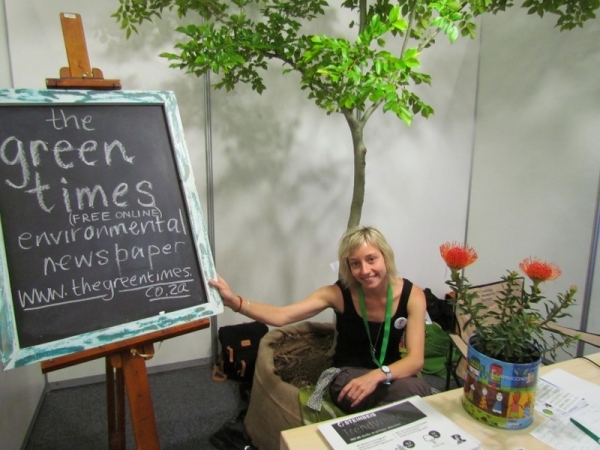 We recently participated in our country’s first Green Expo at the CTICC in Cape Town. Normally we don’t bother to build a stand and sit around at such events. I would much rather walk around, listen to the talks, meet people and cover the event. But this time, we took a small space, determined to erect a truly green space. We have always resisted investing in the usual banner stand to announce our business. Instead our details were features on a black board, which we use for different purposes. This was made possible by my friend Lisa Balz from Lisa Balz Space Design who runs a space saving business – read more at www.lisabalz.co.za … All our copies of the Climate Express, featuring the Climate Train stories, were printed on 100% recycled paper, Papersmith’s Steinbeis Trend White, which we told you about last month. Otherwise paperless – no pamhlets, etc. Naturally, our business cards are printed on 100% recycled cardboard. Whilst I thought I would sit there and write the next issue of the Green Times, there was no time for that at all. I was chuffed with the interest in green news. Almost everyone coming past signed up – many of you now reading this issue. Thank you! I am encouraged to see that South Africans, or at least Capetonians – and many visitors – are eager to keep up to date on the greening of our country. After more than 20 years in eco journalism, it felt like a dream come true. What do you do that’s green, I asked most folk coming past. And would you believe that everyone had a story to tell? From the lady who keeps bees in her garden, very worried that the bee population is half of what it was last year, to a teacher making vegetable gardens at school, to children mobilizing their parents to recycle … our nation is eager to save this planet. Of course there was a super vibe between greenies old and young as well as ecopreneurs determined to make a living doing good. There were enlightening talks, anti-nuclear demonstrations by folk in white suits and gas masks, thanks to the passionate Peter Becker, and an eco fashion show with clothes to die for. And not simply clothes inspired by nature, which is what I’ve seen to date at similar fashion shows. The designs were indeed inspired by the Cape floral kingdom, but every gorgeous garment was also made of re-used materials. Curtains and bedding and all sorts of cloths were given a second life in fashions that would make you green with envy. :) The champion behind this avant garde show was Niki Seegers from Live Eco. Read more at Live Eco. Then there was the elegant event organised by the Enviropaedia – the Eco Logic awards. I was very honoured to have been nominated a finalist for the Eco Angel award. Thank you to David Parry-Davis the father of green in South Africa and THE person, who deserves a medal for bringing out the green Bible, the Enviropaedia for the past 11 years. Get your copy of this ever growing, essential green guide and environmental encyclopaedia here. Michelle Garforth- Venter, the master of ceremonies, said there’s lots that separate us from each other. But we are united by the cause of surviving and maintaining health on this planet. Africa is rising and creating a green template for other nations to follow. We have to stop the most important destruction of all, she said the Green Revolution is the big struggle. The Water Conservation Award: AVIS – the first car rental company to become carbon neutral, but who also recycle more than 80 billion litres of water per year. They dropped the water volumes used to wash their fleet’s cars from 250 litres per car to 20 litres per car! The Recycling Award: Plastics SA, which provides industry training and drives the plastics industry Environmental initiative. The Biodiversity Award: The Diamond Route, which links 9 sites as a holistic project through ecosystem and species conservation, the development of urban conservation, water management, climate change initiatives, through to conservation and restoring areas under its stewardship to their natural ecological state. The Climate Change Award: Rocking the Daisies, as the first festival in SA to fully embrace an eco-friendly alternative to hosting an event of this nature and leads the way in environmentally friendly festivals, together with WESSA’s Share-Net informal network project that supports environmental education through the provision of resource materials. The Youth Award: Tanya Meyer, founder of a school Eco Club, who implemented an Eco Wall with sustainable living tips and environmental information, initiated and owl project and many more. The Eco-Angel Award: Mike Kerr, who runs Animal Outreaches in Port Elizabeth. The Eco-Warrior Award: Mariette Liefferink, CEO of the Federation for a Sustainable Environment, holds a list of important positions on environmental boards and committees and is especially instrumental in protecting our water resources and fighting for mine reclamations. Lifetime Achievement Award: Dr John Ledger, editor of Environment magazine for a lifetime of environmental leadership. Lastly we were honoured by a visit from a gorgeous cheetah, Jeremy, from Cheetah Outreach. The Enviropaedia had donated R66 000 in cash to them to educate farmers and schools and train Anatolian Shepherd dogs to protect herds, so that the awful gin traps which threaten our wildlife would no longer be used. 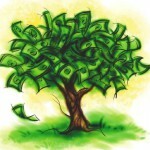 Hi there – any reason why you dont use SA manufactured recycled paper. SAPPI has a good range. Papersmith’s Steinbeis Trend White is from Denmark if I am not mistaken. 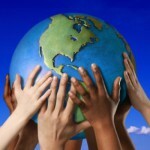 More than 190 countries will celebrate the 49th Earth Day this year. A tropical system off Mozambique threatens to unleash a cyclone just weeks after the country's central parts were ravaged by a powerful storm.